Cryptocurrency markets have seen fresh gains over the last 48 hours and digital asset trade volume has spiked considerably. On Saturday, March 16, the entire cryptoconomy has a valuation of roughly $139 billion and global trade volumes are hovering around $33.7 billion. Is crypto spring or altcoin season starting to bloom? That’s the question everyone’s been asking as over the last week most digital assets have looked bullish. A few months ago the cryptoconomy’s global trade volumes slid downwards showing a lack of market interest. However, over the last few weeks, crypto trade volumes have been steadily climbing and during the last 24 hours, digital currency markets captured $33.7 billion. At the time of publication, the largest market capitalization, held by bitcoin core (BTC), is up today 2.3%. BTC is hovering just above the $4K region at $4,045 per coin and is also up 2.2% for the week. Currently, BTC has a market valuation of around $71 billion and the highest daily trade volume capturing $10.1 billion this Saturday. The second highest valuation is held by ethereum (ETH) and each coin is swapping for $142 per unit. ETH markets are up 3.9% for today and roughly 2.7% for the last seven days. Ripple (XRP) markets sit below ETH and each XRP is trading for $0.31 a token. XRP is up a hair at 1.6% for the last 24 hours and 1.5% for the week. Still holding strong in fourth position is litecoin (LTC), which is up today 4.7% and up over 5.4% for the entire week. Each LTC is swapping for $61 per coin and LTC also holds the fourth largest trade volume today. Lastly, eos (EOS) is up around 3.1% for the day and 1.3% for the week as eos trades for $3.82 per coin on global exchanges. So far, for the entire week bitcoin cash (BCH) prices have been leading the pack as far as the top 10 coins are concerned. BCH is up 15.2% over the last seven days and 10.4% in the last 24 hours as BCH currently trades for $155 per coin. At the moment BCH holds the seventh highest global trade volume above dash and below XRP. Bitcoin cash is the sixth largest market cap today and trade volumes have touched $667 million in the last 24 hours. The top five exchanges swapping the most bitcoin cash are Lbank, Bitmart, Binance, Bitz, and Idax. During the last few market updates, ETH was the dominating pair against BCH but today that position belongs to BTC. At the moment BTC has around 44.2% of all BCH trades and this is followed by USDT (34%), ETH (10.5%), USD (4.7%), and KRW (4.3%). 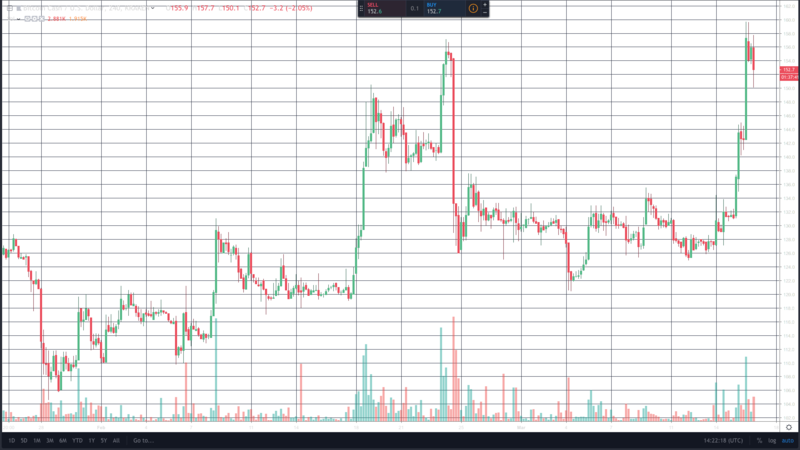 BCH/USD 15-minute Poloniex chart on March 16, 2019. Looking at the 4-hour BCH/USD chart on Bitstamp shows the Relative Strength Index (RSI) is a bit heavy indicating an overbought position. The two Simple Moving Averages (SMA) trendlines show the 100 SMA is still well above the long term 200 SMA. This shows that the path toward the least resistance is still toward the upside but bulls are meeting resistance at the moment. BCH/USD 4-hour Kraken chart on March 16, 2019. 4-hour trade volumes have been decent this month but there’s still a lot of resistance ahead and a chance of a bearish correction. Looking at the order books ahead shows thick resistance up until the $180 per BCH zone and after that things look a touch easier for bulls. On the backside, consolidation has added some decent support and if bears grab the reins then they will see pitstops around $140 and even more around $125. 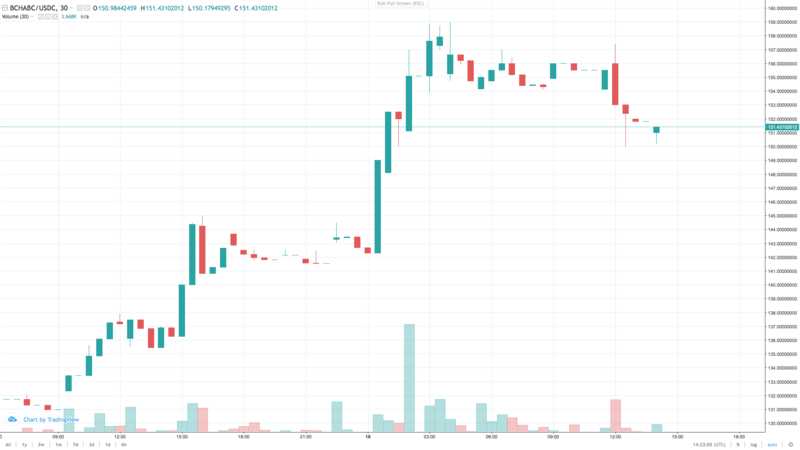 BCH/USD 30-minute Poloniex chart on March 16, 2019. Traders are still very curious about whether or not the recent spikes really are indications of a blossoming crypto spring. Fundstrat founder Tom Lee is at it again with his predictions and assumes bitcoin will see a genuine rally around August.
. “I think it really undermined investor confidence and the dynamics around the market.” Of course, many cryptocurrency traders take Lee’s forecasts with a grain of salt due to his numerous and completely outlandish predictions last year. entrepreneur Nate Henderson on March 15.